Authoritarian government agencies stocking up on ammunition to get bulk discounts, not to wage war. 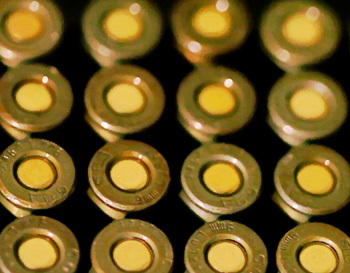 Homeland Security and other government agencies have stocked up, buying more than 1.6 billion bullets (and counting) in recent months. That’s enough ammo for five bullets per head in the American population. The astounding purchase records are admitted fact, but the question is Why? But according to the AP, the real reason, at least the explanation given by government officials, is far “less sinister.” It’s about nothing more than saving money. Agencies like Immigration and Customs Enforcement (ICE) are also purchasing bullets, despite lax border enforcement and plans to legalize tens of millions of immigrants living in the country without documented status. However, Infowars reporters, including Paul Joseph Watson, have noted the alignment of mass quantity bullet purchases with government contingency plans for containing civil unrest in the event of economic collapse, mass-scale terrorism, civil war or widespread natural disaster. Any one of these scenarios could destabilize society, but government would have enough ammunition to wage a 30-year war against Americans, or presumably, to keep the population in line under martial law occupation. Moreover, researchers and analysts have pointed out that record gun sales under Obama, particularly in the wake of his post-Sandy Hook gun control maneuvers, are “maxing out” production of both guns and ammo. These huge purchases by government are taking additional supplies off the market, making many types of bullets scarce and pricey. For authoritarians seeking to reign in gun rights, restricting supply and access to firearms and ammunition is clearly a priority.